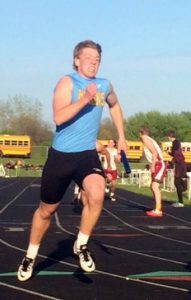 A beautiful night to run helped propel the Lynnville-Sully boys track team to a dominant performance at the 35th annual EBF Rocket Relays on Tuesday, Apr. 25. The Hawks racked up 159 team points in their first-place finish, 37 points more than the next closest team, Sigourney. “We had some outstanding performances, and we are starting to see the progress we want at the right time,” noted L-S Coach Mike Parkinson. The Hawks’ successful night started out with the field events in which L-S athletes won all four events. Junior Jesse Van Wyk claimed the discus with his throw of 109’. Junior Carson Dunsbergen had his best jump ever (6’2”) to win the high jump. Sophomore Rylan James threw the shot 45’ for the victory, and junior Drake Ehresman leaped 17’10” for first in the long jump. Other field event placements came from Ehresman in the high jump placing third after clearing 5’8” and sophomore Grant Wehrle finishing fourth in the discus with a throw of 104’7”. The Hawks went on to win four more events at Eddyville. The hurdlers in particular had a strong night. The shuttle hurdle team of sophomore Gage Vander Leest, senior Caden Dunsbergen, Carson D., and senior Ryan Hofer won their event in 1:03.10. In the 110-m hurdles, Hofer and Vander Leest went one and two respectively in 15.98 and 16.23. Sophomore Tyson Vander Linden claimed the 400-m hurdles in 56.26, his personal best. The other Hawk event to place first was the 4x400 relay with a time of 3:40.15. Team members were Vander Leest, Carson D., Vander Linden, and junior Corey McCoy. In other relays, the sprint medley team (senior Colten Arment, junior Kemper Lukehart, sophomore Nate Stock, Vander Leest) placed second in 1:42.61. Another second-place finish came from the 4x200 team in 1:38.78 with runners Caden D., Lukehart, junior Brevin Hansen, and Stock. The distance medley claimed third in 4:07.86. Team members were freshmen Ethan Wyma and Kinnick McFarland, senior Luke Jones, and Ehresman. The 4x100 team (Stock, Vander Linden, Caden D., Hofer) also placed third with a time of 46.61. Jones, juniors Elijah Collins and Cody Gibbs, and sophomore Ty Breeden ran the 4x800 in 9:52.56 to place sixth. In individual running events, junior Josh Dunsbergen ran his personal best in the 1600-m run with a time of 5:16 for third place, followed by Breeden in sixth with his personal record of 5:27.65. Josh D. also ran in the 3200-m with Hansen. Hansen finished in third at the 11:14.56 mark, and Josh D. crossed the finish line in fifth in 11:58.11. Two Hawks placed in the 800-m run: Carson D. in third with a time of 2:15.14 and Gibbs in fifth at the 2:20.64 mark. Vander Linden ran his best time of 50.64 to place second in the 400-m dash. In the 200-m dash, Wyma came in sixth in 26.87 seconds. The Hawks traveled to Monroe to run in the PCM Classic Boys Invitational Track Meet on Thursday, Apr. 27. The boys were in Class B along with Colfax-Mingo, Sigourney, Wayne, Keota, Melcher-Dallas, and PCM JV. The Hawks have had great success this season, winning six out of the seven meets this year. The Hawks topped the competition with 177 points and won the meet over SICL opponent Colfax-Mingo, who had the next highest score with 140. “We started a little slow and made some mistakes, but we continued to bring our best to the events and challenged ourselves to get better, which we did,” said head coach Mike Parkin-son. In the 110-m high hurdles, senior Ryan Hofer and sophomore Gage Vander Leest placed first and second, with Hofer running a time of 15.59 and Vander Leest finishing in 15.94. “It was a little chilly of a night to run in, but overall we competed very well. With conference less than a week away, I think we have an idea of how things will end up, but we still need to keep improving every day,” said Hofer. In the 400-m dash, the Hawks placed first and seventh. Sophomore Tyson Vander Linden won with a time of 52.44, and senior Luke Jones ran a time of 1:01.72. Vander Linden also placed first in the 400-m hurdles with a time of 56.32, and junior Carson Dunsbergen placed third with a time of 1:01.66. In the 800-m run, junior Corey McCoy placed first with a season-best time of 2:05.87, and junior Cody Gibbs placed fourth in 2:21.40. In the 1600-m run, junior Josh Dunsbergen placed second with a time of 5:18.34. He also placed second in the 3200-m run with a personal best time of 11:40.93. Junior Elijah Collins placed eighth in the 3200 in 14:00. In the 100-m dash, sophomore Nate Stock placed fourth with a personal best time of 11.83. He also placed third in the 200-m dash with another personal best time of 24.42. In the shot put, sophomore Rylan James won with a throw of 45’. High jumper Carson Dunsbergen placed second, clearing 5’8”, and junior Drake Ehresman placed fourth, clearing 5’6”. In the long jump, Ehresman placed fifth with a jump of 17’3.50”. In the discus, junior Jesse Van Wyk placed fifth with a throw of 107’8”, and sophomore Grant Wehrle placed eighth with a throw of 100’01”. The 4x400 relay stayed undefeated with a time of 3:43.30, with teammates Vander Leest, Carson Dunsbergen, Vander Linden, and McCoy. The shuttle hurdle relay team (Vander Leest, seniors Colten Arment and Caden Dunsbergen, Hofer) placed first in 1:03.49. The 4x800 relay also placed first with a time of 9:07.91, with junior Brevin Hansen, Jones, Ehresman, and junior Cody Gibbs. The 4x200 relay took second with a time of 1:41.06. Team members were Caden Dunsbergen, junior Kemper Lukehart, James, and Stock. In the 4x100 relay, Caden Dunsbergen, Arment, Lukehart, and James placed third with a time of 48.50. The sprint med-ley relay finished fourth with Arment, sophomore Evan Squires, Lukehart, and Hofer in 1:50.37. Van Wyk, sophomore Jason Craver, and freshmen Ethan Wyma and Kinnick McFarland were the distance medley relay that placed fourth in 4:27.37. The Hawks were set to run at the conference meet at Iowa Valley on Tuesday and will be at Newton on Thursday.